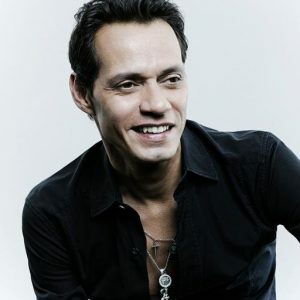 Marc Anthony is an American singer, songwriter, actor, record producer and television producer, famous for his Latin salsa songs and ballads. He is the top selling tropical salsa artist of all time and has also sold over 12 million copies worldwide. He has won two Grammy Awards and five Latin Grammy awards. In 2009, he won the Congressional Hispanic Caucus Institute (CHCI) Chair’s Award. His 1995 album, Todo a su tiempo, which was certified gold with songs like “Te Conozco Bien,” “Hasta Ayer,” “Nadie Como Ella,” “Se Me Sigue Olvidando,” “Te Amare,” and “Llegaste A Mi.” His 2001 salsa album, Libre, which yielded the hit singles “Celos”, “Este Loco Que Te Mira”, and “Viviendo”, spent fourteen weeks at the number-one spot on the Billboard Top Latin Albums chart. Born Marco Antonio Muniz on September 16, 1968, in New York City, to Guillermina and Felipe Muniz, he was raised in New York City with his sister, Yolanda Muniz. He is of Puerto Rican descent. Anthony started his career as a backing vocalist and songwriter for the pop musical groups Latin Rascals and Menudo. He has been married four times and has two daughters named Ariana and Emme and three sons named Cristian, Maximilian and Ryan. *He was born on September 16, 1968, in New York City. *He was named after Mexican singer Marco Antonio Muñiz by his parents. *He knows English and Spanish. *He started his entertainment company Magnus Media in April 2015. *He was ranked #76 on VH1’s 100 Sexiest Artists. *He is a supporter of Democratic Party and attended the 2012 Democratic National Convention in support of President Obama’s re-election. *He is an avid golfer. *He was once engaged to actress Claudette Lalí.